Sword belts and swords were to be worn by all officers on duty and were also worn by mounted enlisted men who carried sabers. The hook on the viewer's right was used to hook the sword up so that it did not drag on the ground. The two snap hooks seen on the viewer's left suspended the sword at an angle when worn free.This particular sword belt was worn by Joshua A. Varian, Colonel of the Eight New York National Guard. 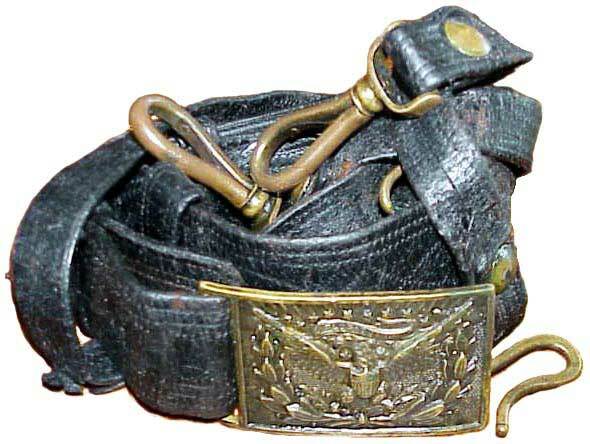 A special Russian leather belt with three stripes of gold embroidery were worn by general officers.